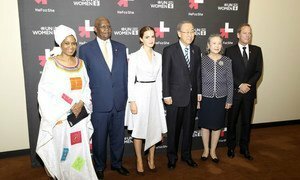 Secretary-General Meets UN Women Goodwill Ambassador Emma Watson in the presence of Phumzile Mlambo-Ngcuka, Executive Director of UN Women. At the World Economic Forum in Davos, Switzerland, today, UN Women, the United Nations entity dedicated to achieving women’s empowerment and gender equality, unveiled a new initiative to galvanize the support of global leaders to bring an end to the persisting inequalities faced by women and girls around the world. At a press conference in the Swiss city, UN Women Global Goodwill Ambassador Emma Watson, who launched the HeForShe campaign in September, said this next phase, HeForShe IMPACT 10X10X10, will focus on engaging governments, businesses and universities to make concrete commitments to advance women’s empowerment. “Women share this planet 50/50 and they are underrepresented, their potential astonishingly untapped. We are very excited to be launching IMPACT 10x10x10 to bring the HeForShe into the next phase,” said Ms.Watson alongside UN Secretary-General Ban Ki-moon, Executive Director of UN Women Phumzile Mlambo-Ngcuka, as well as several political and business leaders. The World Economic Forum’s Global Gender Gap Report 2014 highlights a large current gap between men and women in terms of political engagement and opportunity and little improvement in equality for women in the workplace since 2006. Universities join the impact trio because youth engagement represents one of the greatest opportunities for accelerating progress toward the achievement of gender equality, and ending violence against women. Launching one of the largest solidarity movements of the 21st century, Secretary-General Ban Ki-moon and UN Women Global Goodwill Ambassador Emma Watson, opened a star-studded event in New York this evening with strong calls on men and boys worldwide to raise their voiced for gender equality today and women's empowerment.